This is a refurbished 500-sheet input tray for use in: HP LaserJet P4014, P4015, P4515, M601, M602, M603 series printers. Replaces part numbers CB518-67901 , CB518A. This product is easy to install -- it is placed directly underneath your printer giving you an extra 500 sheet capacity. 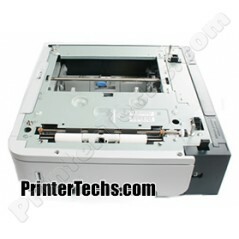 This is a refurbished 500-sheet input tray for use in: HP LaserJet P4014, P4015, P4515, M601, M602, M603 series printers. This product is easy to install -- it is placed directly underneath your printer giving you an extra 500 sheet capacity.